About Rock Reach House - A Unique High Desert Modern Escape. Available for rent now on VRBO in Yucca Valley near Joshua Tree, California. Rock Reach House is a steel house featuring polished concrete floors and large amounts of glass. The only wood in the entire structure is in the custom cabinets and the interior doors. The all-electric home includes a large array of photovoltaic panels on the roof of a two-car carport that create nearly as much electricity as the house uses (a connection to the grid means the house is never without power). It is a small home (1,000 square feet) that lives large. Sliding glass doors in all rooms bring the outside in -- making the home feel much larger than it is. Private patios open off of each bedroom and a large front deck is accessed from the living room and the kitchen. Each of the two identical-size bedrooms features a California king bed. Furnishings are simple, sleek and modern. The fully equipped kitchen features high-end appliances. Wireless wi-fi is available throughout the house and satellite TV service is in the living room. An apartment-size stacked washer-dryer is available for quick clean ups. A heating and air conditioning system is augmented by ceiling fans in each bedroom. Outside find a large fireplace with free firewood provided. There is a Jacuzzi-brand hot tub nestled in a private cove of rocks with long views across miles of open desert. A large galvanized outdoor stock tank (our cowboy tub) is used in warm months for cool dips. 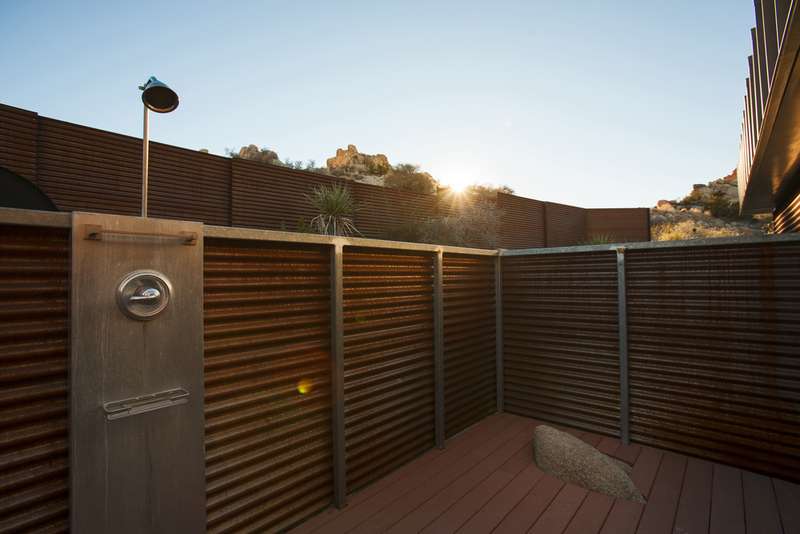 An outdoor shower is on the large, private deck that is accessed via a door from the indoor shower. Rock Reach House was designed by the award-winning and innovative folks at o2 Architecture in Palm Springs. It is the first house from Blue Sky Building Systems. Solar photovoltaic panels send excess electricity back into grid. Ceiling fans in bedrooms reduce need for air conditioning. Gray water system disposes of waste water from shower, bathroom sink and washing machine. On-site water well and holding tanks. House is not dependent upon municipal water agency. Micro FAST four-chamber septic system (including evaporation mound) for black water. High-performance “E²”double-pane windows and doors. Cabinets made with bamboo (Plyboo) fronts and FSC certified boxes. Only wood in house found in cabinets and interior doors and frames. No use of propane or natural gas in house. A seasonal stream flows uninterrupted under house. Minimal damage to land...home sits on six small footings. All steel used manufactured with up to 70 percent recycled steel. Factory fabrication of most elements meant dramatically less waste created. Waste created in factory immediately recycled. Prefabrication of elements meant far less site waste needing to be taken to landfill. Waste created during construction sorted and recycled. Rapid construction meant far fewer pickup truck trips to and from job site by workers. All materials in the home can be recycled.